My name is Josh Spece. 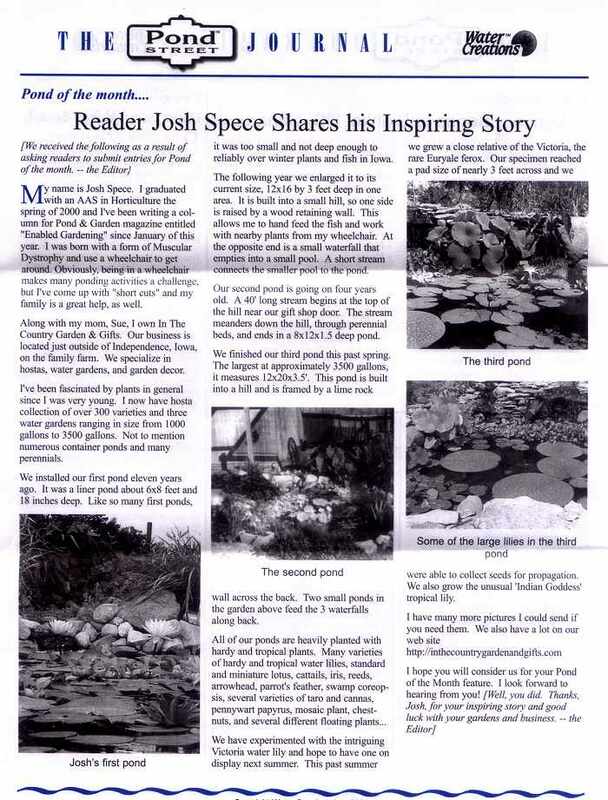 I graduated with an AAS in Horticulture the spring of 2000 and I've been writing a column for Pond & Garden magazine entitled "Enabled Gardening" since January of this year. I was born with a form of Muscular Dystrophy and use a wheelchair to get around. Obviously, being in a wheelchair makes many ponding activities a challenge, but I've come up with "short cuts" and my family is a great help, as well. Along with my mom, Sue, I own In The Country Garden & Gifts. Our business is located just outside of Independence, Iowa on the family farm. We specialize in hostas, water gardens, and garden decor. I've been fascinated by plants in general since I was very young. I now have hosta collection of over 300 varieties and three water gardens ranging in size from 1000 gallons to 3500 gallons. Not to mention numerous container ponds and many perennials. We installed our first pond eleven years ago. It was a liner pond about 6x8 feet and 18 inches deep. Like so many first ponds, it was too small and not deep enough to reliably over winter plants and fish in Iowa. The following year we enlarged it to it's current size, 12x16 by 3 feet deep in one area. It is built into a small hill, so one side is raised by a wood retaining wall. This allows me to hand feed the fish and work with nearby plants from my wheelchair. At the opposite end is a small waterfall that empties into a small pool. A short stream connects the smaller pool to the pond. Our second pond is going on four years old. A 40' long stream begins at the top of the hill near our gift shop door. The stream meanders down the hill, through perennial beds, and ends in a 8x12x1.5 deep pond. We finished our third pond this past spring. The largest at approximately 3500 gallons, it measures 12x20x3.5'. This pond is built into a hill and is framed by a lime rock wall across the back. Two small ponds in the garden above feed the 3 waterfalls along back. We have experimented with the intriguing Victoria water lily and hope to have one on display next summer. This past summer we grew a close relative of the Victoria, the rare Euryale ferox. Our specimen reached a pad size of nearly 3 feet across and we were able to collect seeds for propagation. We also grow the unusual 'Indian Goddess' tropical lily. 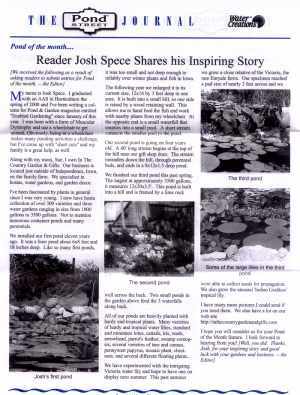 I hope you will consider us for your Pond of the Month feature. I look forward to hearing from you!